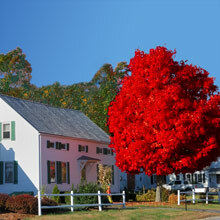 Are you dreaming of a beautiful red tree for your Fall yard? 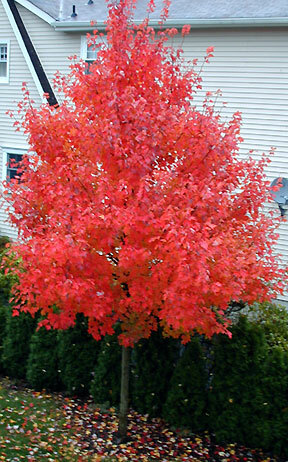 Many people are planting an Autumn Blaze Red Maple for its crimson color. But consider a few other fall beauties as well. Autumn Blaze grows to 50 feet tall and 30 feet wide at maturity. The foliage is very dense and provides a lot of shade. That can reduce your air conditioning bills by about 50% if you plant the tree on the south or west side of your house. Some people think the form of the tree is not perfect and is better planted in a group of trees. That’s a matter of personal preference. I like a grouping of three trees that show different colors in the Fall. To be sure of the color, buy the tree at a local nursery or garden center in the fall when you can see the color. There can be variations in color from the same variety of trees, so it’s great to be able to choose your tree in person. I much prefer that to ordering a tree when the foliage color is important. Also you can choose a tree that looks healthier than the others. If you want to plant a grouping of trees with colors that look good together, buying them at the same time in the autumn is a good way to do that. October Glory Red Maple has a similar size to the Autumn Blaze Maple, but is faster growing and has good red color. Other red maples are similar in form and hardiness. All red maples say acer rubrum on the tag and should be good trees to plant. 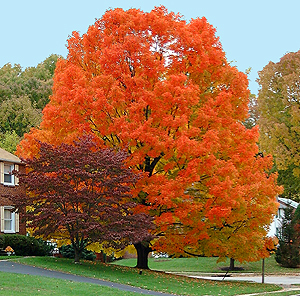 Here is what the Arbor Day Tree guides says anbout October Glory Red Maple. And check out A Tree Grower’s Diary to see how an October Glory Red Maple looked for the writer from year to year. Red maples generally have a more pleasing shape than silver maples or the Autumn Blaze. A tree with a pleasing shape will look great on it’s own as the star of your yard. Here’s an interesting discussion of Autumn Blaze vs. October Glory at GardenWeb. It includes tips for what you need and what you don’t need for planting that the garden center might try to sell you. They also give an idea of what’s a good price for one of these trees. I really like Garden Web as a place to ask questions and get answers from experienced gardeners–all for free. My Favorite: the Sugar Maple. This tree gets huge! At maturity it is 60-75 feet high with a 40-50 feet spread. Think carefully about that before you choose where to plant it. It has brilliant color often with a mixtures of yellow, orange, and red. It is almost a spiritual experience to stand under one in full color! Guaranteed to lift your spirits! You might even have fun trying to make maple syrup with its sap. It is deer resistant as a bonus. Here are some great tips for planting any maple to get it off to a good start. Fall is the best time to plant a maple tree because the cool air helps the roots develop better. So don’t wait until spring to plant these beauties. You can go to your local garden center or nursery to get advice for which trees grow well in your area. Most of the “big box stores” like Lowe’s, Home Depot, and Menards give a year’s guarantee–so save your receipt! You are likely to find trees on sale in the Fall. As I’ve said before, Fall is a great time to plant a tree! Most areas get quite a bit of rain in the Fall, so you don’t need to water as much or worry about excessive heat. Remember that these trees are deciduous and will lose their leaves in the late Fall. Planting them where they will give shade to your house on a summer afternoon will make your home cooler in the summer. And when the leaves fall, the sun can warm your house in the winter. Your investment of time and money will repay you many times over on your utility bills for years to come. Plus if you ever sell your house, the beautiful trees will help you sell. Not to mention all the great photos of fall leaves and your house you’ll have. Then there’s all the fun the kids will have jumping in piles of leaves! Ah, Fall. Click here for a chart of different maple trees with their characteristics. It’s part of a store, but I have no affiliation or experience with them. Hi Sylvia! I know! I just love Fall! Crisp days, clear air, trees changing colors . . . Then there are all the yummy foods! Thanks for your comment! Thank you for your comment, Kebab. Hope so see you around the blog! They ARE beautiful! Love Japanese maples too! I hope you are enjoying Fall. Thanks for stopping by, MC! Looking forward to your posts again! We love Maples! We have a Japanese maple in our yard and it is definitely worth the investment.